Biloxi, Miss. 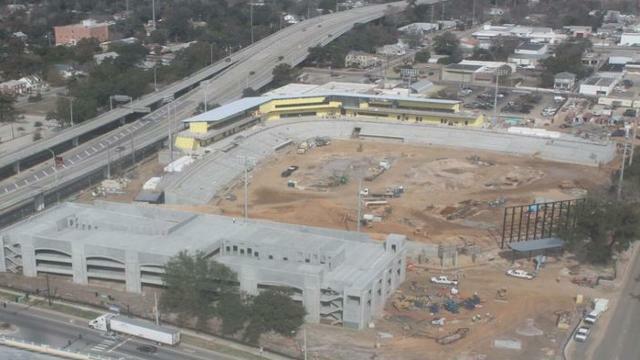 - The Biloxi Shuckers Baseball Club announced today that they have made provisional plans to play games away from Biloxi, while construction continues on MGM Park. Construction remains ahead of schedule, but a temporary plan has been set in place. The following schedule adjustments are being made. The Shuckers' scheduled home opening series against Jacksonville, April 20-24, against the Suns will be moved from Biloxi to Jacksonville, Florida with the Shuckers serving as the home team. After a five-game series at Pensacola, April 25-29 the Shuckers will head to Joe Davis Stadium in Huntsville, Alabama and host a five-game series against the Mobile BayBears, April 30-May 4. After an off-day on May 5, the Shuckers will head to Pearl, Mississippi to take on the Mississippi Braves for a five-game series, May 6-10 at Trustmark Park. The Shuckers will function as the home team for that historic series between the two professional baseball teams in the state of Mississippi. The M-Braves are offering free admission to any Biloxi fan wearing Shuckers merchandise. "We're extremely excited that the Mississippi Braves have allowed us to play these historic games in the state of Mississippi," said Biloxi Shuckers GM Buck Rogers. "We are thrilled that Shuckers fans that wear our gear will be able to get in free and hope to create a home field environment for us." "Although we don't have an occupancy date for MGM Park at this time, we will give the Southern League a seven-day notice to shift these home games to MGM Park once that date becomes available," added Rogers. Biloxi travels to Jackson, Tennessee for a five-game set with the Generals and will then return to Huntsville for a 10-game homestand against Jacksonville, May 16-19, featuring a doubleheader on Monday, May 18, with first pitch at 4:40 p.m. After an off-day on May 20, the Shuckers welcome the Birmingham Barons to Joe Davis Stadium, May 21-25. Click HERE for the most up-to-date schedule for the 2015 season. For up-to-date news and notes visit biloxishuckers.com, follow the club on Twitter (@biloxishuckers), Instagram (@officialbiloxishuckers) and like the team on Facebook (facebook.com/biloxishuckers). Season tickets for the 2015 season are on-sale now by calling (228) 233-3465.